It was a response to a possible solution for the DSO that I had made back in August at the Cello Chat forums. I tend to envision an orchestral world that isn’t so dominated by European styled Orchestras sure–and I’m not at all shy about stating my desire to form my own World Music Orchestra that would be international in a way that Orthodox Orchestras will probably never be. As Detroit itself has the largest Arab population in North America (and by some accounts the second largest Arab population outside of the Middle East — after Rio) I’ve been watching the slow growth of Classical Arabic and traditional Middle Eastern ensembles throughout the greater metro area. Once the population density for “non-typical” Americans in regions reaches a critical mass, I suspect those ethnic groups will be figuring out ways to support the art ensembles and traditions of their respective cultures. As far as outreach is concerned, that’s what Bassam Saba has been doing using his role with the New York Arabic Orchestra as one starting point. Just looking at his Arabic music seminar (see previous link) for the first half of this year he’s taking the grassroots approach he had with the NYAO to try to jump-start similar ensembles in other regions, including the Detroit/Dearborn area. I recall the DSO also premiered a concerto for Oud and Orchestra in ’08 written by long-time collaborator of Bassam Saba, Simon Shaheen, which I would love to know the relative success it was received by the community though I remember the Arab community being pretty excited about the event. I doubt many US based ensembles are prepared to cater to the growing demand of immigrant or non-Euro-American audiences, but there is an increasing number of performing opportunities for musicians to engage in (especially for strings which have traditionally been a part of Middle Eastern ensembles for nearly two centuries) and other possibilities for the enterprising musician with conservatory training. Now that I think back on it, I’m not so sure it was a spiteful retort, or that any malice was intended. For all I know the post might have been genuinely curious or intrigued with the idea. I’d like to think that, but I’m not so sure that is the case. It seems like these kinds of ensembles are desperately trying to find some legitimacy in a part of the world that’s been so exclusively dominated by the art music (Western Classical Music) of one small part of the world (the total combined population of North America and Europe doesn’t even come close to that of, say, India much less China for example) and with a growing non-Euro-American population it shouldn’t be surprising to see more and more groups like this. And in the end if we’re talking about donors/audiences and their relationship to Art music ensembles, what are the chances that, say, Arab-American donors/audiences will support the New York Philharmonic over the New York Arabic Orchestra? I’m not saying that no Arab-Americans will support the NY Phil, or that no non-Arab-Americans will support the NY Arabic Orchestra. Only that there will be at least some biasing in the decisions for our charitable dollars or entertainment dollars will go. Which reminds me that I must get back to blogging about the economics of underserved audiences–especially now as the issue is very much on my mind! 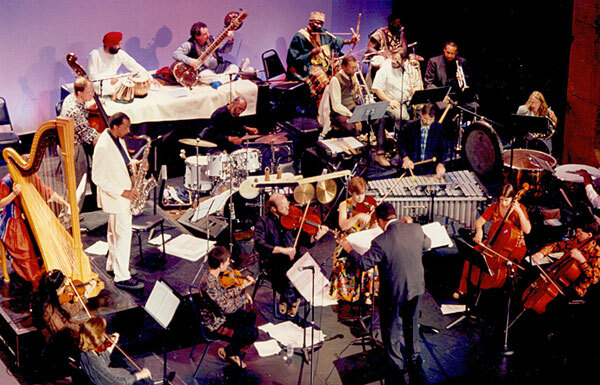 I played a show with Keni’s OMniverse Jazz Sinfonia some years ago–nowhere near as elaborate and exotic an ensemble as the one pictured, unfortunately. The VI-CO event sounds cool! I’ve also been thinking about this topic in relation to what’s happening in Detroit. It seems to me that the administration is having a change of heart in terms of what they want in their musicians. This is sort of an undeveloped thought, but what if the future elite of the elite are considered not just by their ability to play western music, but also by their ability and enthusiasm for music outside of their typical comfort zone? I noticed that when SacPhil played the piece by Abbassi that they weren’t exactly thrilled and no one seemed particularly into it. They were animated and almost wild with the Mozart and Beethoven that they love, but were extremely subdued with the Abbassi piece. Granted, it was a more pensive piece, but it was clear it wasn’t what they really loved.